The best crispy fish tacos! 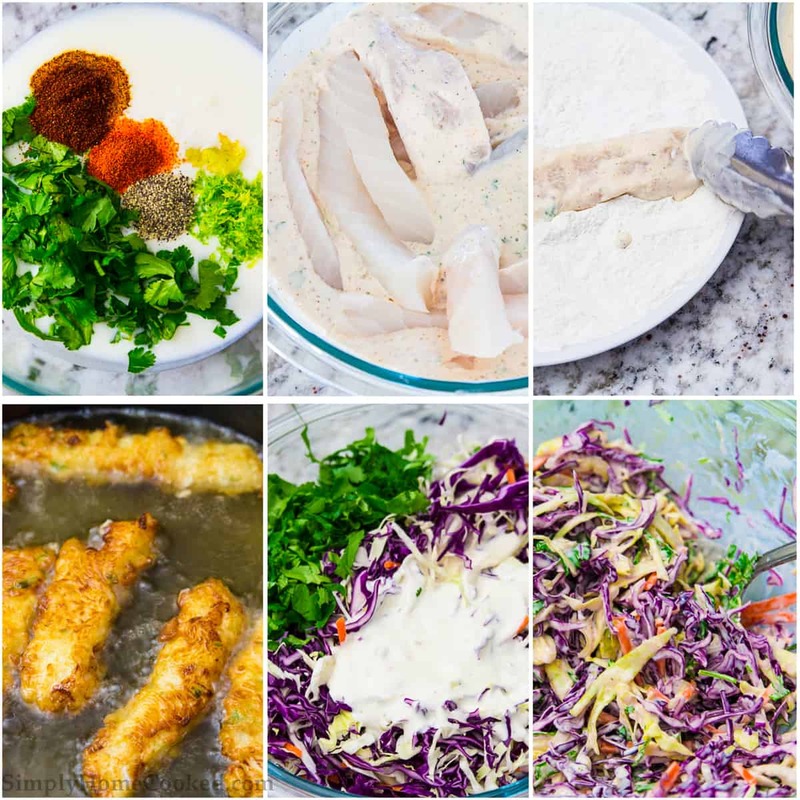 This recipe is made with fried cod, Baja cream, and purple cabbage cole slaw. Easy to make with these step by step photos. Enjoy these fish tacos with my shredded carrot salad for a colorful and nutritious meal. This recipe was originally posted April 25, 2017, we’ve tweaked it a bit since then. This post may contain affiliate links. Read my disclosure policy here. Crispy battered cod fillets, Baja cream slaw, and tortillas are what make the perfect Baja fish tacos. The slaw and fish marinade can be made in advance which makes this dish very convenient for many of us. It’s easy enough to make for a weeknight dinner yet festive enough to serve to your guests. You can even serve it in a “taco bar” style. Just lay out the tortillas, fried fish, Baja cream slaw, pico de gallo, and guacamole. Then have your guests choose whatever they want in their taco. How do you make fish tacos? I’ll share my no-fail recipe with you. Every single spice and ingredient adds something unique that you won’t forget. My two favorite things about these tacos are the crispy fish and the tangy purple slaw. Together they are a stunning and beautiful mixture. 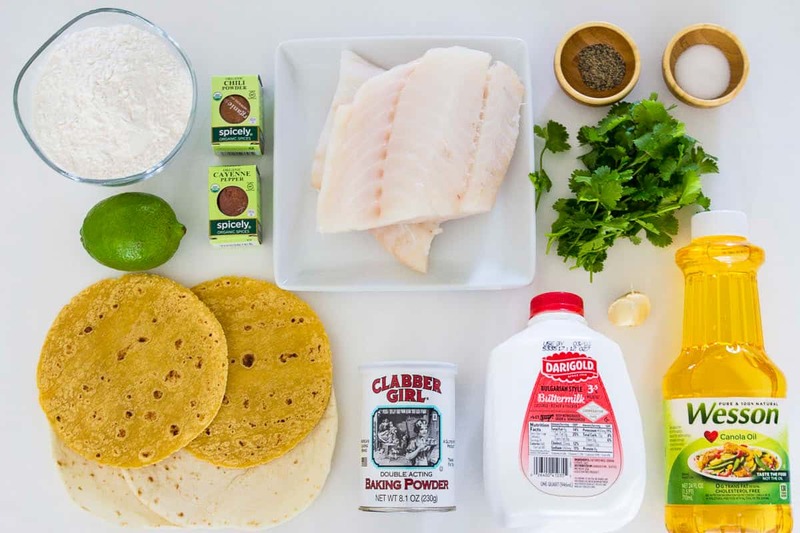 Make sure you have these items on hand when you want to make your fish tacos. According to NPR, fish tacos originated in Baja, California, Mexico. The combination of a crispy battered fish with the slaw and the creamy sauce all started in one of two cities on that scenic peninsula. Street vendors invented the culinary masterpieces. What is in Baja cream sauce? It has a combination of creams and spices that is incredibly unique. Since their invention, fish tacos have always had a crunchy slaw topping. But what else can you put on a fish taco? You’ll find the entire recipe at the very bottom of this post. But here is a quick overview of what to expect when you make your own tacos. 1. Combine the buttermilk, cayenne pepper, chili powder, lime zest, garlic, black pepper, and 1/4 cup chopped cilantro. 2. Cut the cod fillet into strips and submerge them in the buttermilk marinade. Cover with plastic wrap and let it sit in the refrigerator for at least 2 hours. 3. Meanwhile, begin making the Baja cream by combining the sour cream, mayonnaise, rice vinegar, black pepper, and 1 grated garlic clove. 4. Chop the cabbages, carrot, and cilantro. Then place them into a bowl and toss it with the Baja cream (This will be your slaw). 5. Combine flour and baking powder. 6. Fill a skillet with about 1-2 inches of oil and bring it to medium-high heat. 7. Dredge each cod fillet into the flour mixture and fry in the hot oil about 2-3 minutes per side. Then transfer to a plate lined with paper towels to absorb any excess oil. 8. Assemble your tacos immediately. 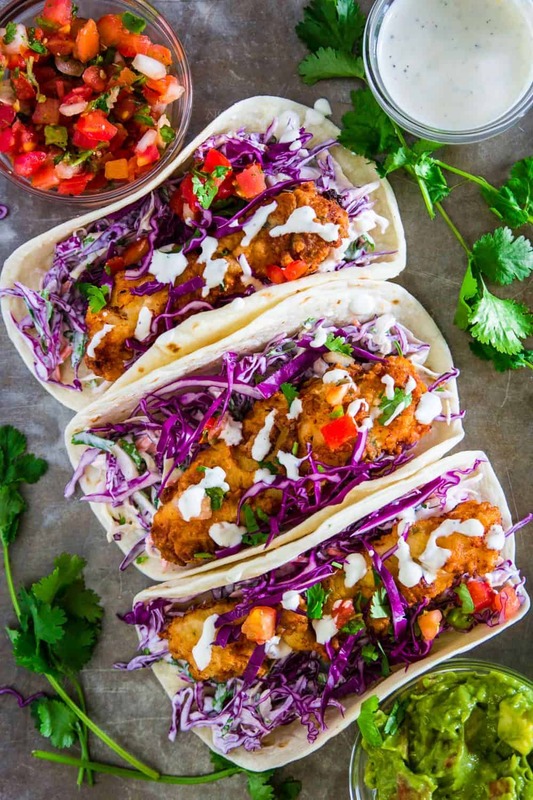 Using the tortilla of your choice (corn or flour) add the Baja cream slaw, then place 2 crispy cod fillets and top it with extra cilantro, pico de gallo, or guacamole. Combine buttermilk, cayenne pepper, chili powder, lime zest, 1 grated garlic clove, black pepper, and 1/4 cup chopped cilantro. Cut the cod fillet into strips and submerge them in the buttermilk marinade. Cover with plastic wrap and let it sit in the refrigerator for at least 2 hours. Meanwhile, begin making the Baja cream by combining the sour cream, mayonnaise, rice vinegar, black pepper, and 1 grated garlic clove. Chop the cabbages, carrot, and cilantro. Place it into a bowl and toss it with the Baja cream. This will be your slaw. Combine flour and baking powder. Fill a skillet with about 1-2 inches of oil and bring it to medium high heat. Dredge each cod fillet into the flour mixture and fry in the hot oil about 2-3 minutes per side. Transfer to a plate lined with paper towels to absorb and excess oil. Assemble your tacos immediately. Using the tortilla of your choice (corn or flour) add the Baja cream slaw, then place 2 crispy cod fillets and top it with extra cilantro, pico de gallo, or guacamole. Looks wonderful and tastes even better! Very easy to prepare. Thank you.